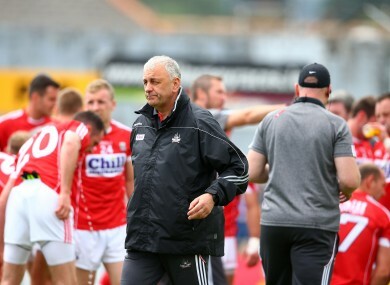 Cork boss Peadar Healy at their Munster final in Killarney. CORK WILL BE forced into at least one change for next Saturday’s All-Ireland qualifier against Mayo, while the Rebels management are monitoring the fitness of other players who came off injured in the Munster final. Corner-forward Niall Coakley, who made his championship debut in that game in Fitzgerald Stadium, has been ruled out of the tie at the Gaelic Grounds after suffering a leg injury in the game in Killarney. Coakley scored two points from frees in the first half of that game but did not emerge for the second-half action due to the injury. Three other Cork players came off injured in the second half of that game with the Kingdom as Michael Shields and Ruairi Deane both sustained leg and facial injuries respectively, while James Loughrey was concussed. Their fitness is being monitored ahead of Saturday evening’s Round 4A tie at the Gaelic Grounds at 5pm. It will be the first championship meeting between the counties since the 2014 All-Ireland quarter-final when Mayo prevailed by 1-19 to 2-15. Of the 21 players Cork used over the course of that match, eight are no longer part of their squad. Damien Cahalane is a key member of the Cork hurling side with Brian O’Driscoll and Brian Hurley both out with long-term injuries. Defender Noel Galvin is no longer involved while Fintan Goold, Patrick Kelly, Daniel Goulding and John Hayes have all retired since that game in Croke Park three years ago. Email “Cork forward out injured for Mayo clash as Rebels wait on others facing fitness battle”. Feedback on “Cork forward out injured for Mayo clash as Rebels wait on others facing fitness battle”.